Dear Eleanor: In the words of President Harry S. Truman you were indeed the “First Lady of the World,” a humanitarian, civic leader, champion for the poor and women, at home and abroad, through the United Nations that you helped to develop. Looking at you portrayed in early pictures, a rather Victorian young girl looks out wistfully from the photo unaware that her concern for the oppressed would become her trademark, nor would anyone have expected you to evolve to such heights of accomplishment as a humanitarian benefactor. Despite obstacles thrown in your path you were a woman determined to succeed beyond the restraints imposed as the daughter of an affluent New York family and became one of the most important women of the 20th century. With your marriage to your handsome distant cousin Franklin D. Roosevelt, who had embarked on a political career, you evolved from society wife tending the household and five children and unwittingly entered the world of politics. Activism was so inbred in your concern for the oppressed and when Roosevelt was Assistant Secretary of the navy during World War I, you volunteered for the Red Cross and became an active member of the women’s suffrage movement. Eleanor once said, “A woman is like a tea bag-you never know how strong she is until she gets in hot water,” and her activism attests to this edict. However, Franklin Roosevelt’s ambitious career in politics was altered irrevocably in 1921, when a bout with polio left him crippled. Despite therapy Franklin’s physical activity was extremely limited and temporarily halted his brilliant career expectations. To the fore came Eleanor his constant and faithful companion. It was Louis Howe, Franklin’s political mentor, who urged Eleanor to become vocal in the Democratic Party so that the name Roosevelt would not be forgotten. Could this shy, society bred young woman rally to the task? Indeed, she did making speeches and political appearances, and discovered that she could segue into this new role and had a liking for politics. 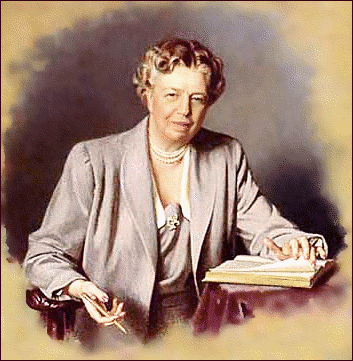 In time Eleanor became an old hand at politics and her steadfast encouragement enabeled Franklin Roosevelt to return to politics and win the governorship of New York (1929-1933). In this role Eleanor became the “good wife” behind Franklin, acting as his political surrogate, speaking on his behalf to the American people and relaying their concerns to him, but most significantly she always gave her input as well. When FDR was elected to the presidency, Eleanor realized that as a president’s wife she was expected to concern herself merely with social issues. However, these were unusual times and the Great Depression and FDR’s “New Deal” program offered her opportunities to rise to the forefront of the administration. Since Roosevelt was incapacitated he depended on Eleanor to go out into the trenches, so to speak, and find out firsthand about the national condition, observations that he could not make. Eleanor proved to be a great source of comfort and inspiration to the nation. She toured the country extensively and with her nurturing sensitivity she observed the poverty-stricken country side, city slums, prisons and even insisted on visiting inside a coal mine. She became the first activist first lady and she urged swift action to change conditions that she considered intolerable. With press conferences and her daily column in the nation’s newspapers she kept the public aware of White House politics, in particular the New Deal. With her vivid descriptions of the country’s dreadful conditions, she persuaded FDR to create the National Youth Administration (NYA) to provide financial aid to students and job training for young men and women. Her contribution to the Roosevelt era was marked by innovative measures to foster a better America. She also worked closely with the National Association for the Advancement of Colored People (NAACP). Her power to right an unjust situation was notable. You may remember that she resigned from the Daughters of the American Revolution in protest to their preventing singer Marian Anderson from performing at Constitution Hall. After the United States entered World War II; Eleanor took off overseas. She channeled her energies into the war effort and as assistant director of the Office of Civilian Defense, she visited U.S. troops abroad, provided visible comfort to wounded service men in England, the Caribbean and the South Pacific, which boosted morale. When Franklin died in office in 1945, Eleanor thought that she would retire, but her career was not over. Although she have garnered international respect and admiration as First Lady she took on another challenging role and became a delegate to the United Nations General Assembly. In 1948, she drafted the Universal Declaration of Human Rights, which affirmed life, and equality internationally for all people, regardless of race, creed or color. This document would become her greatest legacy.